Goodway CNC turning centre from Taiwan. WITH more than forty year's experience, Ron Mack Machinery is a premier supplier of specialist metalwork machinery and continues to provide the market with innovative and technologically advanced machinery. Austech 2004 provides an opportunity for Ron Mack Machinery to feature leading metalwork machinery from around the world. Making its first appearance at Austech will be the Goodway GS-280 CNC turning centre. Goodway is one of Taiwan's largest manufactures of CNC lathes, producing in excess of 700 lathes annually. 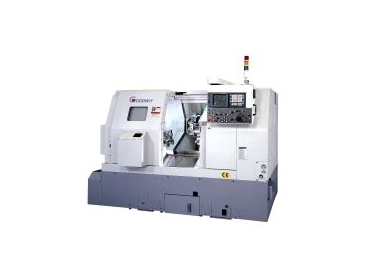 The GS-280 features a swing of 470mm, maximum turning diameter 400mm, turning length of 570mm, 10" Kitagawa chuck, 75mm bar capacity and 25hp spindle motor. Live tooling and sub-spindle are also available for the GS-280. Also on display at Austech 2004 will be the Australian-made Scalen 970FX. The 970FX hydraulic press brake features technological advances including the Delem control panel with a Windows-based operating environment. The Scalen 970FX is sure to attract attention with its powerful networking functions, high speed operation allowing greater productivity and improved performance and advanced design ensuring a hydraulically stable and rigid machine. Making a return appearance at Austech after a successful year will be the Mitseiki VMC-40. The VMC-40 offers a versatile heavy duty vertical machining centre with substantial power, large travels and simple yet powerful Siemens Conversational Control. The Mitseiki comprises a solid four box way construction for heavy duty cutting and integrated chip auger allowing no fuss swarf removal. Other machines featured on the Ron Mack Machinery stand include a TOS TRENS universal centre lathe, an Akyapak section roll, a Ficep hydraulic punching and shearing machine and a GRIT universal belt and pipe notch grinding machine. Visit the Ron Mack Machinery stand E40 at Austech 2004.